Russia has another very significant advantage over the U.S. as Vietnam’s counterpart for political dialogue. 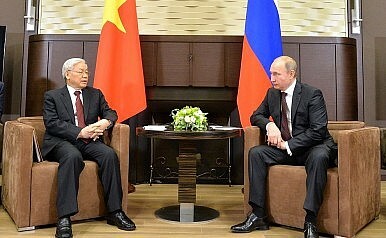 In the eyes of the Communist Party of Vietnam cooperation with Russia is not accompanied by any kind of “hostile” ideology export. There is no fear that Moscow will be pushing for reforms the Party cannot afford at this point in time and Russia will not be setting any conditions for military equipment trade, investment, or humanitarian cooperation. And this is precisely the kind of concerns the elites in Vietnam have about their romance with the United States. What Russia can’t afford in its relations with Vietnam is as important a question. Ties with the West severely damaged by the Ukraine crisis, China has got all the attention as the centerpiece of Moscow’s new Asia-Pacific rebalance. There is thus almost no way Russia would risk its rediscovered partnership with China by supporting Vietnam’s approach to the South China Sea issue (not to mention the territorial claims themselves). On the other hand, the Obama administration has made it rather clear that it would pay great attention to any state that has issues with the Chinese march for regional leadership. To put it bluntly: Vietnam’s quarrels with China are one of the drivers of its partnership with the U.S. and one of the irritants in its partnership with Russia. But it is not just Beijing’s invisible hand holding back the Russia-Vietnam relations. The economic downturn in Russia means it can’t match the U.S. as a buyer of Vietnamese goods. The Eurasian Economic Union-Vietnam Free Trade Area (FTA) set to take effect in 2016 may foster bilateral trade, but the country’s share of Vietnamese exports will most likely remain below 2 percent. The purchasing power and the structure of economic relations is just too different from that of the U.S.
Where does that leave us? The U.S.-Vietnam rapprochement, as impressive as it may be, is certainly not a marriage, but more of an affair. Going too far in this affair and causing too much trouble to China may entail a disaster for a small state like Vietnam. Diversification is key to becoming a middle power and Russia’s potential for being the “third force” is immense. If the U.S. administration really wants a strong, independent, and stable Vietnam, it should respect its long-term ties with Russia. With all the U.S. limitations on military cooperation, it is essentially Russia that is doing most of the work building Vietnamese maritime capacity and imposing the costs for China. It would be very unwise to create linkage between U.S.-Russia tensions in Europe and let them spill out into Asia. Anton Tsvetov is the Media and Government Relations Manager at the Russian International Affairs Council (RIAC), a Moscow-based foreign policy think tank. He tweets on Asian affairs and Russian foreign policy at @antsvetov and blogs for Russia Beyond the Headlines (Asia). The views expressed here are the author’s own and do not reflect those of RIAC. Nguyen Phu Trong in the U.S.